In this project, I sought to understand theories of power and information flows from a critical Indigenous perspective. This set of papers and research projects allowed me to locate spaces for Indigenous thought in the theoretical foundations of information science. Through these works, I investigated how theories and methodologies of network science, ecological information systems analysis, actor-network theory, and other sociotechnical approaches can help advance Indigenous thought, as well as how Indigenous thought can advance information scientific concepts and approaches. Predoctoral Fellow:Mellon Sawyer Borderlands Seminar. B/ordering Violence: Boundaries, Gender, and Indigeneity in the Americas. The Simpson Center for the Humanities at the University of Washington. Co-Investigators: Jose Antonio Lucero, Juan Guerra. Reference: Duarte, M.E. "HB 2281: Suppressing Intellectual Freedom in the US-Mexico Borderlands," Center for Mexican American Studies at the University of Texas, Austin, February 13, 2013. Reference: Duarte, M.E. "Decolonizing Communications: Mapping Undersea Cables Toward Resisting Pax Americana," Native Organization of Indigenous Scholars, University of Washington, Seattle, May 9, 2012. NativeSUN and the Alien Transfer Exit Program: How the Diffusion of Technologies Subverts Power To and Exerts Power Over Social Groups. Reference: Duarte, M.E., "NativeSun and the Alien Transfer Exit Program: How the Diffusion of Technologies Subverts Power To and Exerts Power Over Social Groups," Unpublished manuscript, Indigenous Information Research Group at the University of Washington, Seattle, March 2011. Stigmatization, Militarization, Land Reform: Tracing the Massacre of Mazacoba. Reference: Duarte, M.E. "Stigmatization, Militarization, Land Reform: Tracing the Massacre of Mazacoba," Unpublished manuscript, Indigenous Information Research Group at the University of Washington, Seattle, March 2010. Research Assistant: Connecting with People Beyond Information: Studying Empathy in the Design of Health Technologies. The Significance of Information from a Critical Indigenous Consciousness: Colonizing and Decolonizing Technologies. References: Duarte, M.E., Krebs, A., Belarde-Lewis, M. "Information: A Critical Analytic for Indigenous Scholars," Panel presentation, Native American and Indigenous Studies Association, Sacramento, California, May 22, 2011. Metoyer, C., Duarte, M.E. "The Indigenous Information Research Group and Native Systems of Knowledge," Tribal College Librarians Institute, Bozeman, Montana, June 7, 2010. Duarte, M.E. "The Significance of Information from a Critical Indigenous Consciousness," Native American and Indigenous Studies Association, Tucson, Arizona, May 22, 2010. Belarde-Lewis, M., Day, S., Duarte, M., Krebs, A. "Native Systems of Knowledge: Indigenous Methodologies in Information Science," iConference, Urbana, Illinois, February 6, 2010. Belarde-Lewis, M., Day, S., Duarte, M. "Identity and Information in the Struggle for Indigenous Autonomy," Native Organization of Indigenous Scholars University of Washington, Seattle, April 3, 2009. Duarte, M.E. "The Significance of Information from a Critical Indigenous Consciousness: Colonizing and Decolonizing Technologies," Unpublished manuscript, Indigenous Information Research Group at the University of Washington, Seattle, March 2009. In collaboration with the Indigenous Information Research Group at the University of Washington and the National Indian Child Welfare Association. References: Belarde-Lewis, M., Duarte, M., Krebs, A., Metoyer, C. Building Capacity Through Information Policy: The Law Library of Congress Sovereigns Within a Sovereign Project. In collaboration with the Indigenous Information Research Group, the National Congress of American Indians Policy Research Center, and The Law Library of Congress. Duarte, M., Krebs, A., Metoyer C. "Building Capacity Through Information Policy," National Congress of American Indians Annual Summit, Albuquerque, New Mexico, November 10, 2010. Belarde-Lewis, M., Duarte, M., Krebs, A., Metoyer, C. "Information Strategies for Tribal Governance," National Congress of American Indians Tribal Leader/Scholar Forum, River Bend, South Dakota, June 22, 2010. Preliminary Assessment: National Congress of the American Indian Policy Research Center Information Clearinghouse. In collaboration with the Indigenous Information Research Group and the National Congress of the American Indian Policy Research Center. 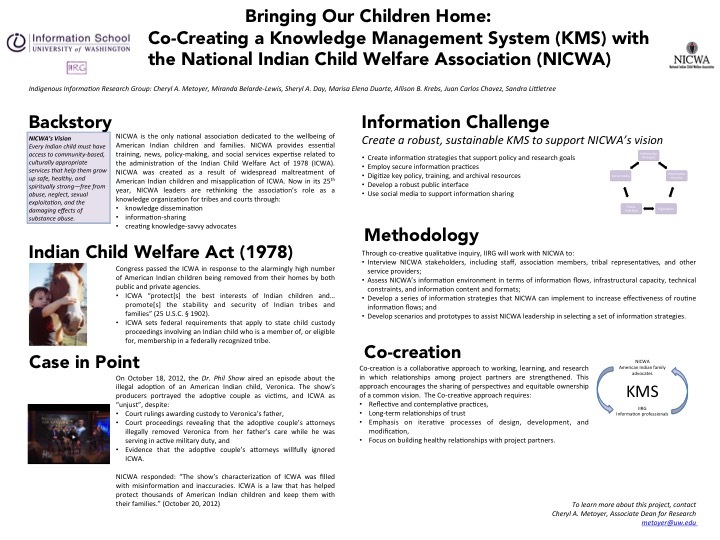 "Co-Creating a KMS for NICWA"